Mississauga – Reflecting over the last twelve months, I remain humbled and honoured to represent the compassionate, hardworking and dynamic people of our great City as their Mayor, said Mayor Bonnie Crombie today, as she formally marks her one year anniversary from when she officially took the oath of office as Mississauga’s head of council, succeeding Hazel McCallion. “And from the moment this new Council was sworn in, we hit the ground running,” Crombie added. Crombie concluded “As we look toward 2016, and the promise of a new year ahead, there is more to be done. I am excited about this work and seeing it through. Click here to watch Mayor Crombie’s inaugural address and for the full text of the Mayor’s speech. 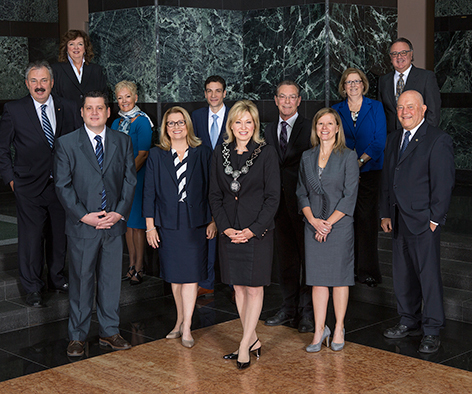 Photo Caption: Mayor Crombie with Mississauga City Council 2014-2018.